Nintendo spent a lot of time explaining its new collection of minigames for the Wii U. There was a lot of hope for what Nintendo would reveal for this year's E3 press conference. After announcing the Wii U in 2011, the bar was high for what games would appear on the new console to convince us to buy into a new generation early. The big concept President of Nintendo of America Reggie Fils-Aime tried to get across was "asymmetrical gameplay" between players using the Wii Remote and the Wii U gamepad. 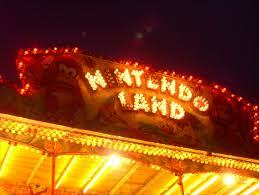 The flagship title to showcase this new kind of play was Nintendoland, a "digital theme park" as Reggie called it. To the rest of us, a game like Nintendoland is known as a collection of minigames similar to what the company has seen success with in Wii Sports and Mario Party, and Nintendo hopes it works as well. According to Fils-Aime, Nintendoland is what you need to play to fully understand the dual screens and asymmetric gameplay provided by some players watching the TV and others the Wii U gamepad. "Play it, and you'll understand," he said. To make very sure we understood, a pair of producers played a minigame in Nintendoland called "Luigi's Ghost Mansion" and explained what was going on the screens in detail. The players using the Wii remotes were human characters in a maze, and the controller would rumble when they got near the ghost but otherwise they had no way to detect it. The fifth player, using the gamepad, controlled the ghost and could sneak up behind the other players to take them out. No release dates for Nintendoland or the Wii U were announced. There wasn't even a confirmation that Nintendoland would be the pack-in for the new console, but that would make a certain amount of sense given how Wii Sports sold seven bushels of Wiis. The whole demonstration seemed a little involved for a E3 presentation, but I appreciated the designers actually talking about how the game played rather than the "Bang! Zoom!" showiness that permeates the rest of E3. Unfortunately for Nintendo, the reveal of Nintendoland was not a very good note to end their annual presentation, and the crowd left the Nokia theater in L.A. feeling underwhelmed.